The world’s second-largest carmaker Toyota has completed 20 years in India. Operating in India through its joint venture with the Kirloskar Group, the carmaker has sold over a million cars in India to date. At present, Toyota’s India line-up comprises the Innova Crysta, Fortuner, Corolla Altis, Camry Hybrid, Yaris, Etios, Etios Liva, Etios Cross, Prado, Land Cruiser and Prius. 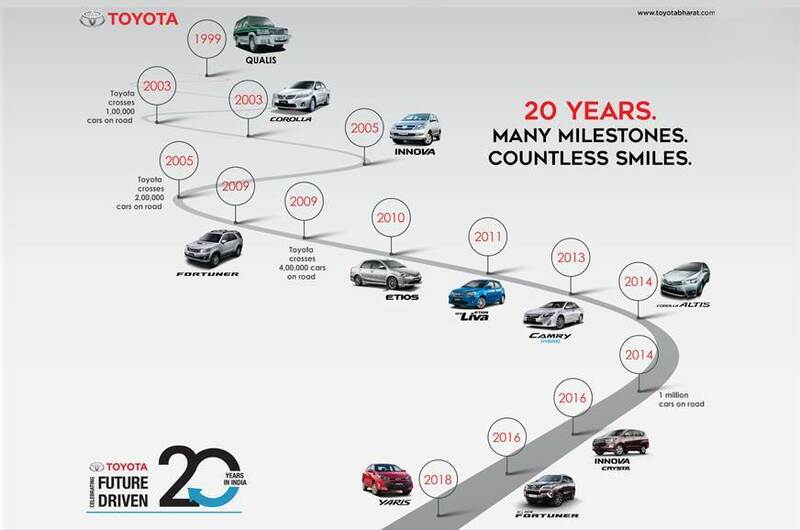 To recap, Toyota’s India journey started with the Qualis in 1999. The utility vehicle was boxy and appeared as an outdated hand-me-down. However, the model quickly made a mark for its reliability and positive word of mouth helped sales cross 1,00,000 units by 2003. The next big hit from Toyota came in the form of the Innova that went on sale in 2005. 2009 saw the introduction of the Fortuner SUV, which – along with its platform mate, the Innova – remains a money spinner for Toyota in India to this day. The Corolla and Camry sedans have also been consistent fixtures on Toyota’s line-up. 2010 marked the arrival of the made-for-India Etios sedan that was followed by the Etios Liva hatchback in 2011. The Etios twins, however, didn’t sell to potential and remain average sellers in their respective segments. 2014 was a landmark year for TKM as it crossed the 1 million sales milestone. In FY 2017-18, Toyota sold 1,40,645 cars, making it India's sixth-largest carmaker. Even though Toyota is not the largest carmaker in India, it’s partnership with Suzuki could take things into next gear. The partnership came about as Toyota and Suzuki began working on electric vehicle technology together. This partnership provided Suzuki with electric vehicle technology while Toyota reaped the benefits of having access to Maruti Suzuki’s popular mass-market models – like the Baleno, Ertiga, Vitara Brezza, etc. – which will help it plug the product gap it currently has. In India, Toyota has just launched an update for the Innova Crysta and Fortuner which includes an updated interior, albeit no mechanical changes. It has also added a new base ‘G’ variant to the Innova Crysta’s current line-up.